Cy Bagano was born and raised on the island of Kaua‘i and is the youngest of four siblings. 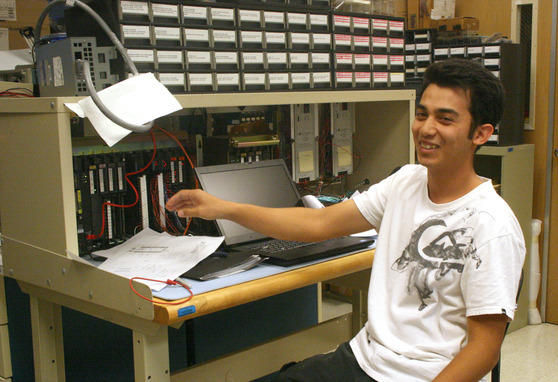 He is currently an Electronics Technology student at Kaua‘i Community College. After graduating in Spring 2011, he hopes to further his education. In his free time he likes to hang out with his friends, play video games, go to the beach, work on cars, and listen to music. The W.M. Keck Observatory’s twin telescopes are both equipped with Laser Guide Star Facilities (LGSF). The LGSF generates an artificial guide star in the mesosphere for use with adaptive optics image correction. The Keck II LGS Adaptive Optics System will be upgraded with a Next Generation Adaptive Optics System (NGAO)—instead of a single laser, the NGAO system will use three lasers to generate a seven-beam asterism to improve image correction over a wider field. This upgrade will continue Keck’s leadership in Adaptive Optics. The NGAO project recently completed its Preliminary Design Review. A key NGAO subsystem is the LGSF Safety System Controller (SSC) that protects personnel and equipment from the radiation generated by the laser, using the American National Standards Institute (ANSI) standards for radiation exposure as guidelines in its design. The NGAO SSC will be upgraded to a system similar to the existing Keck I SSC. The NGAO SSC uses an Allen Bradley SLC-500 Programmable Logic Controller (PLC). The PLC uses Ladder Logic as a programming language and interacts with the LGSF subsystems for status and control. This project will provide the SSC design and process for the Detailed Design Phase. The PLC will be programmed with a number of safety interlock features, such as closing the laser’s fast shutter in the event that a person enters the LGSF room. Testing of the design will be completed using software emulation.